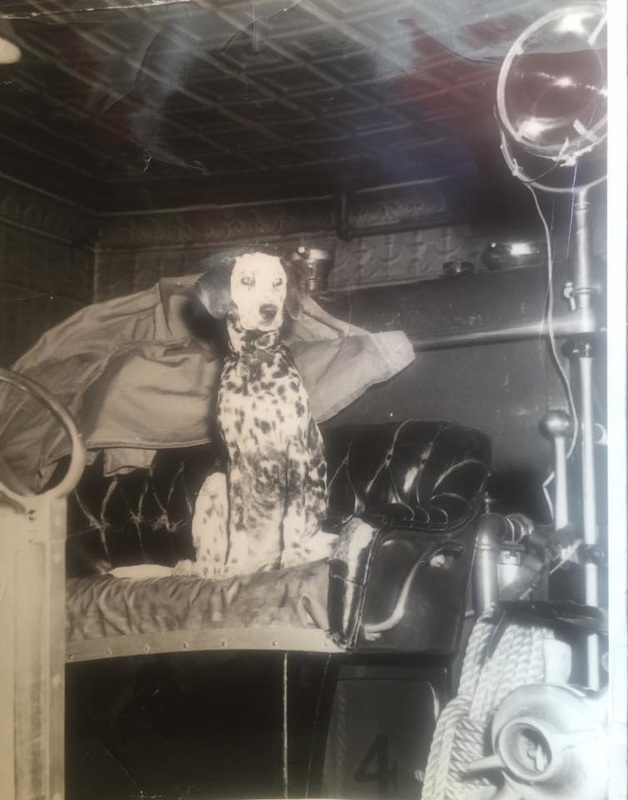 The history of most fire departments across the United States includes pets and the animal most commonly associated with firehouses, firemen and fire engines is the dog, especially the Dalmatian breed. These faithful and intelligent animals represent an old breed that were originally know as "carriage dogs." They had a natural affinity for horses and loved to run alongside their owners coaches. 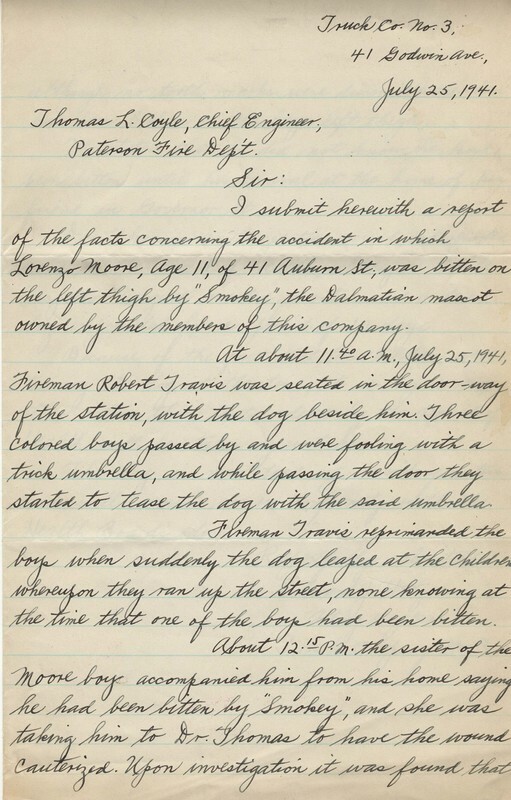 So it is easy to understand how they became known as "fire dogs" during the 19th and early 20th centuries when horses were prevalent in firehouses. 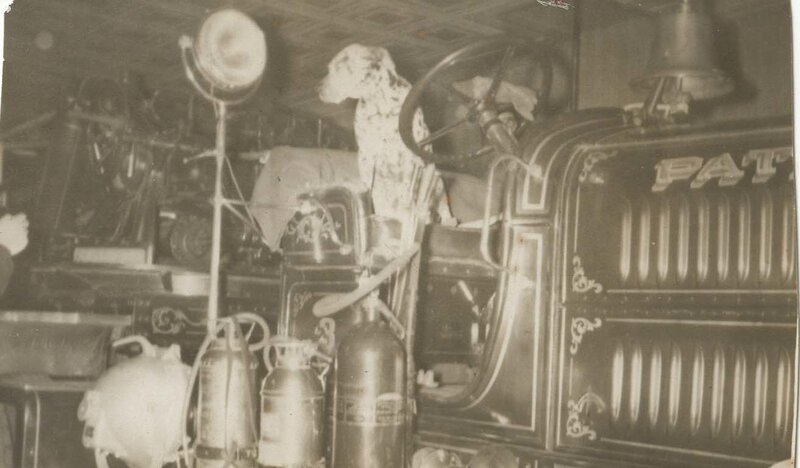 Almost all of the old fire department lithographs and photos show dalmatians leading horse drawn steamers or even sitting on the later motorized engines. 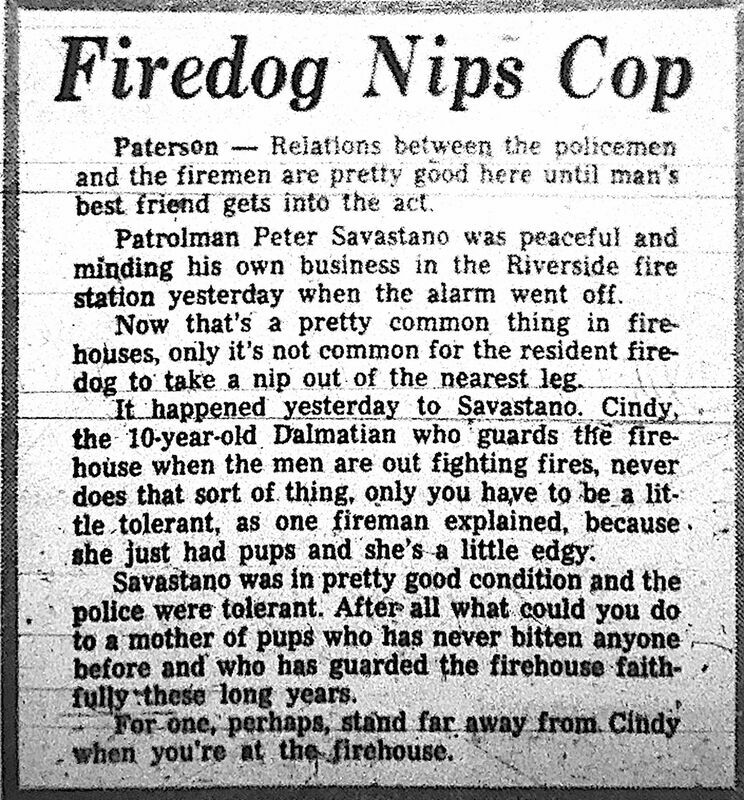 There have been many Dalmatians associated with the Paterson Fire Department but few records exist detailing their stories. 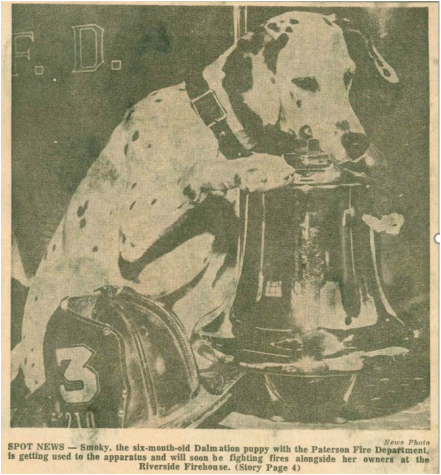 During the Ahrens Fox era several dogs were mascots in Engine Company 3, 4 and 6 ,Trucks 1 and 3. 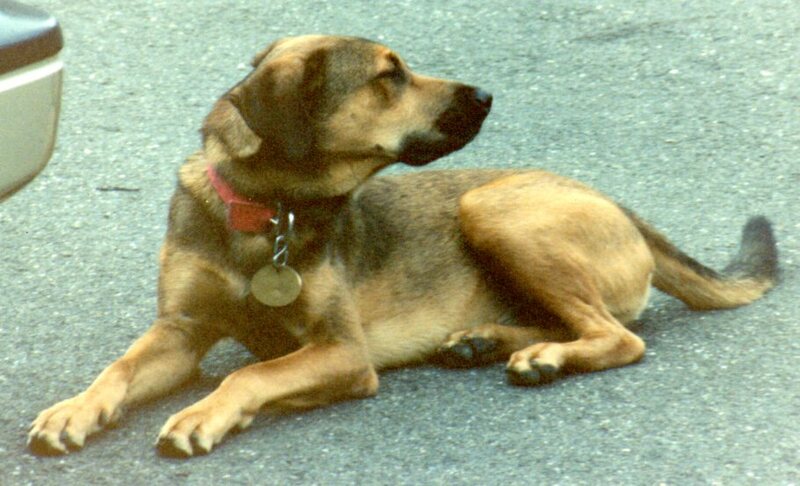 Truck 3's dog was called Smokey (seen below) and when he rode with the apparatus he was decked out with a red and gold blanket bearing his name. 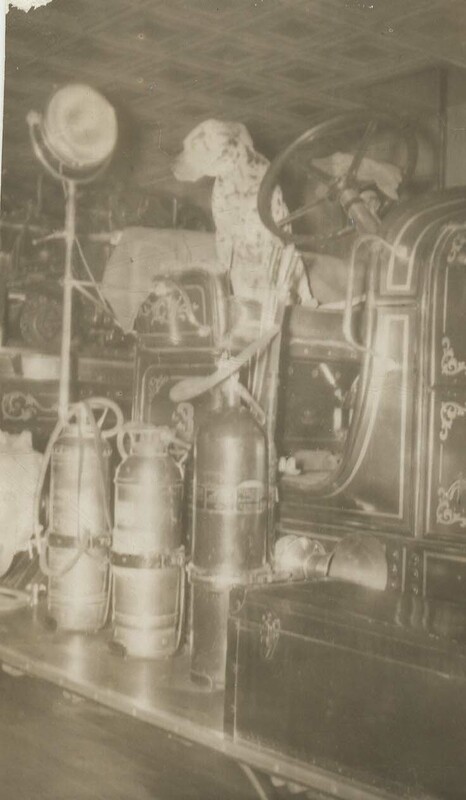 There is a famous picture from the Paterson News with Smokey sitting up high in the tiller seat with his front paws steering the apparatus. 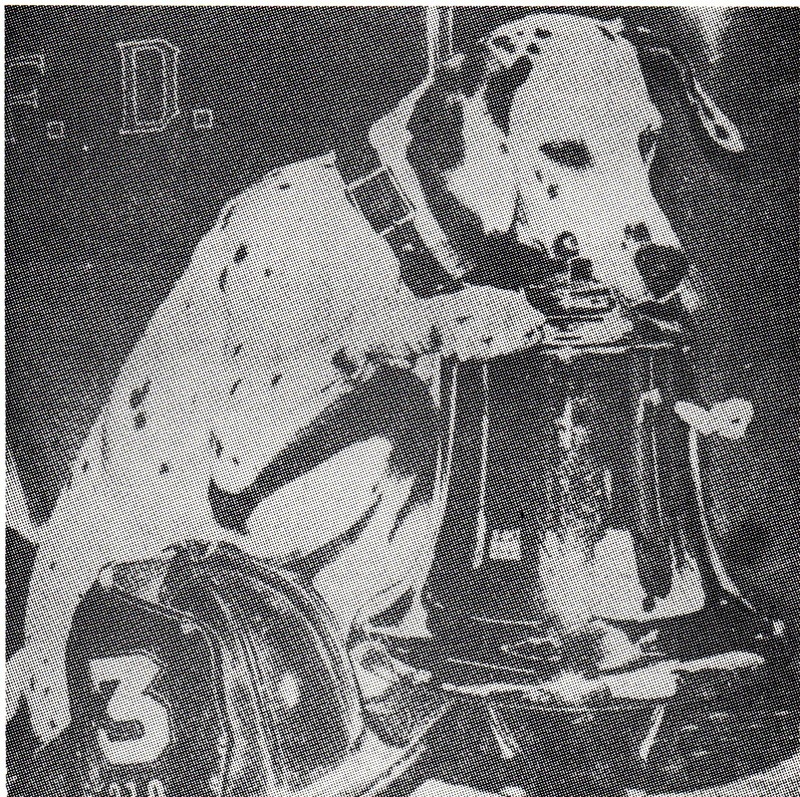 Engine Company 4's dalmatian was named Fritz and on his collar wore a special badge engraved with his and the Company name making it official for him to accompany the men as they worked. 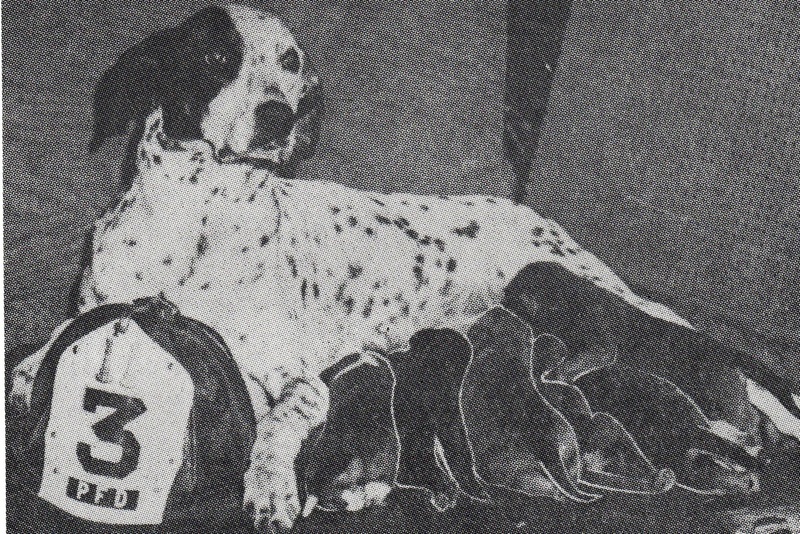 After he passed away, the men of E4 obtained a female dalmatian called "Princess." 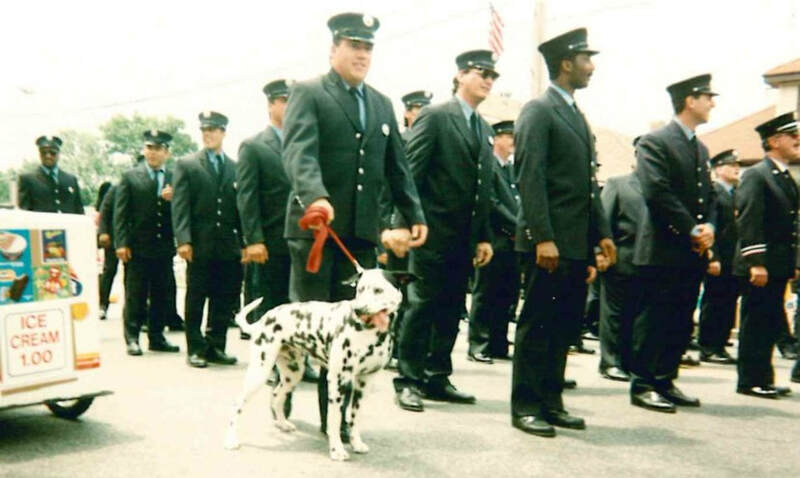 ​Engine 3 on 12th Avenue had two Dalmatian pups called "Chief" and "Mate." 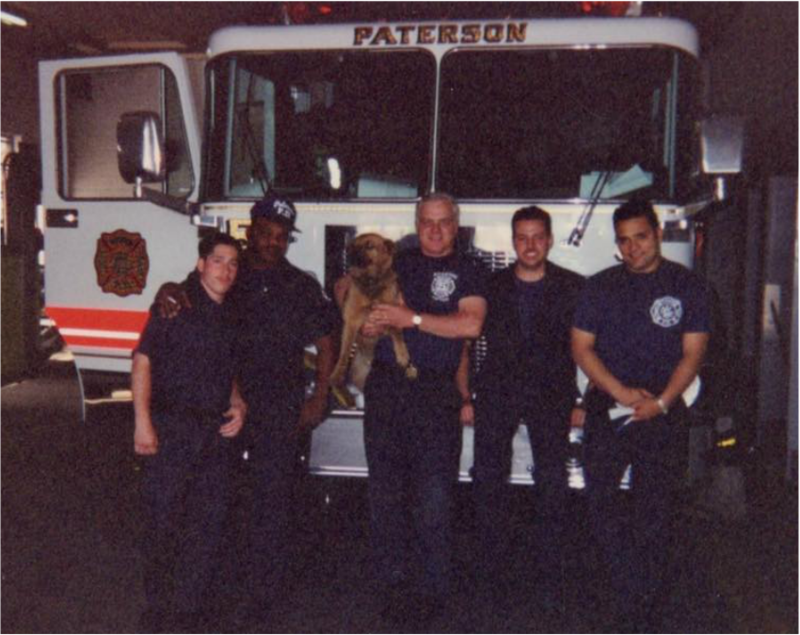 The firemen of Engine 6 regarded their dog "Buttons" as a good luck charm. 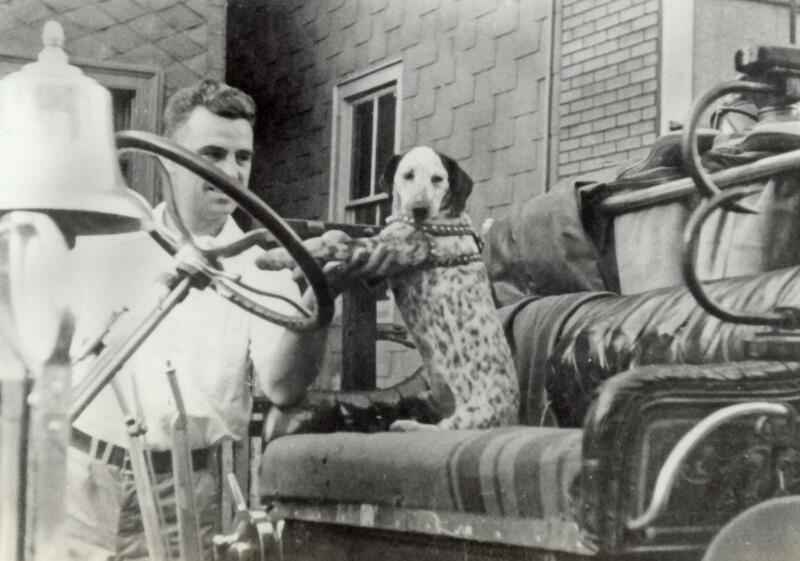 Engine 3 also had a Dalmatian called "Skipper" who is seen below (sitting in the driver's seat of the cab of the company's Ahrens Fox pumper) with Captain Lester Reiche. 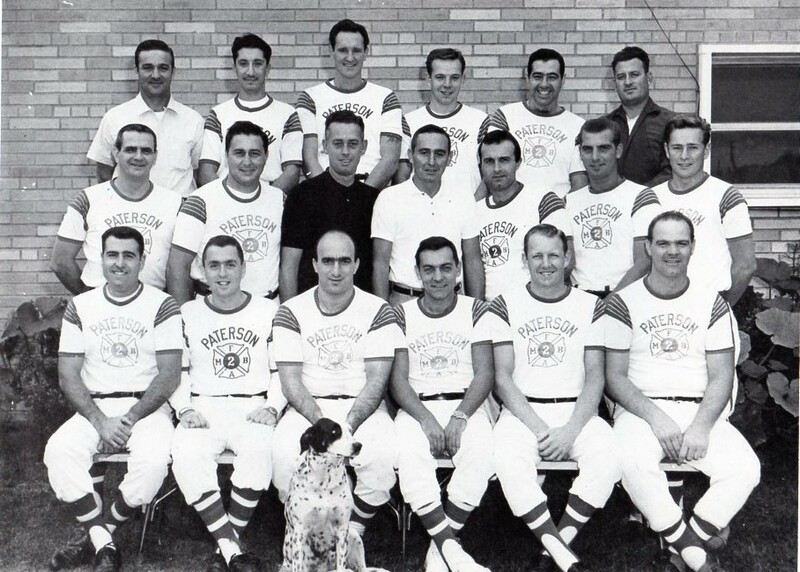 May 14, 1962: 3 alarm fire at 704-710 Main Street (across form St. Joseph's Hospital).Smokey is made an honorary department member/mascot by the FMBA. Photo is at Engine 9 at 586 Main Street. FF Robert Woodruff, Roger Dumas and Captain Joe Leonard. 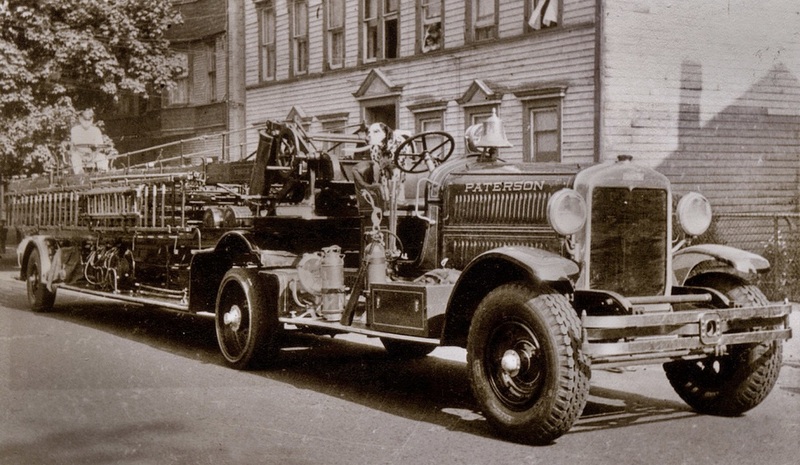 In rear is the company's 1953 Seagrave pumper. 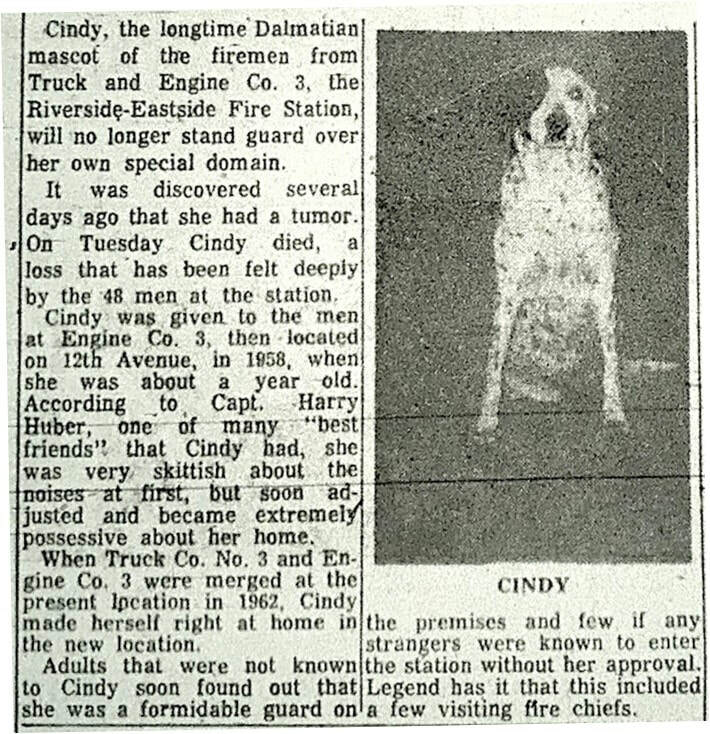 Among the most famous Dalmatians was "Cindy" who was given to the men of Engine Company 3 on 12th Ave in 1956. Her markings were quite distinct in that she had a large patch over the right side of her face and ear. In her early years with the company she had her own seat on the apparatus and often entered buildings with the firemen. During her first pregnancy she became too heavy and then retired from active firefighter to house watchman. She developed a habit of gathering the men's scattered shoes and placing them at the rear of the firehouse after the apparatus left quarters. Cindy's favorite fireman was Captain Lester Reiche who often took her swimming in a nearby park. 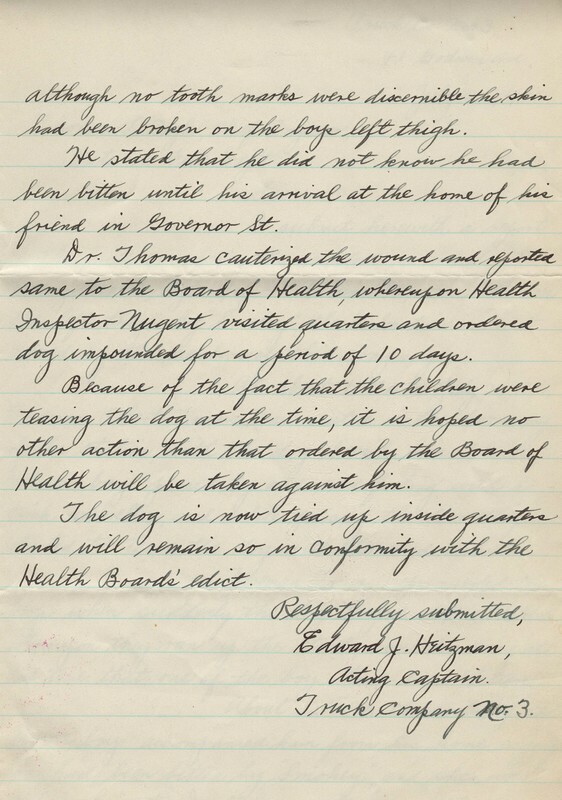 The dog took it very hard when the Captain made the Supreme Sacrifice. 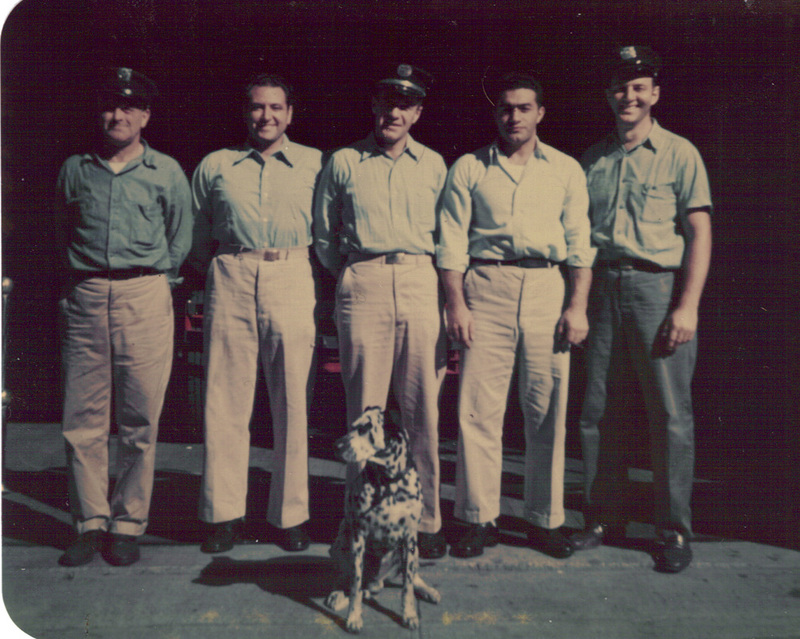 Top- Joe Brower, Tom Alala, Howie Marcom, George Maloney, Frankie Calamita & Bill Savage. Middle- Joe White, Mike Ross, Fred Ricciardi, Bill Vitale, Mel Gabriel, Joe Saia & Randy Reid. 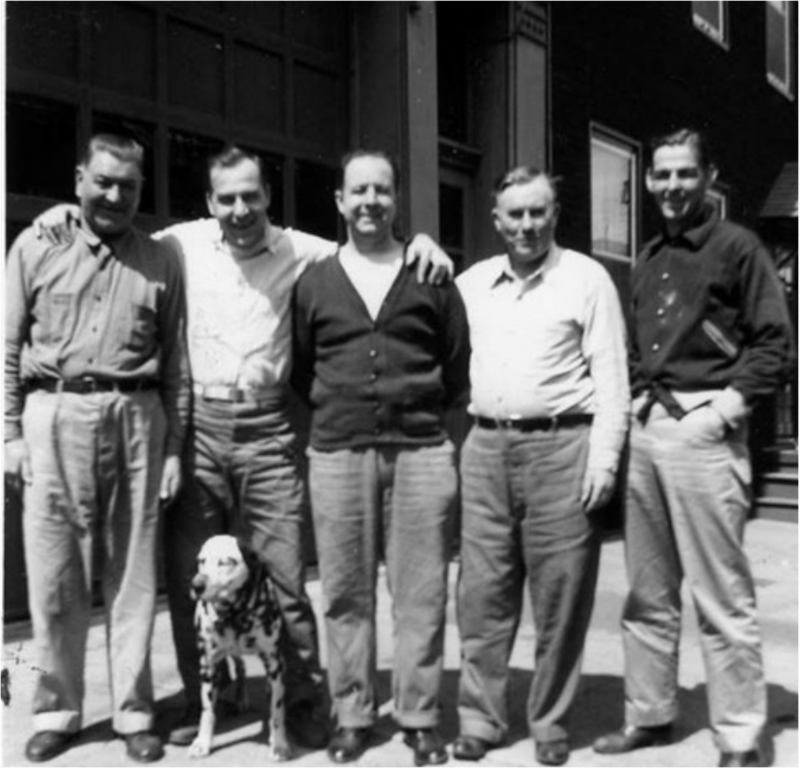 Bottom-Angelo Maza, John Mauro, Tippy Nicolazzo, Frank Malzone, Bill Shortway & Red Mosca. It was a very sad day when she finally passed away in 1967. She was so famous that the Paterson Evening News ran a obituary story with a picture on September 12. 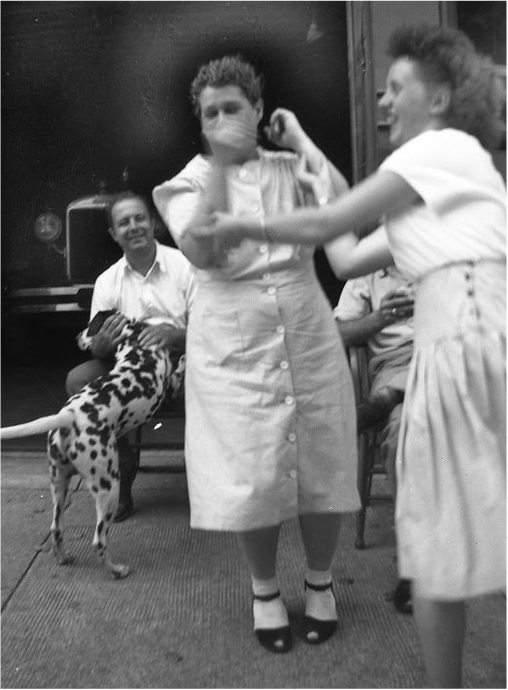 An unusual way of obtaining a Dalmatian occurred in 1969 when then Assistant Chief William Comer wrote a winning essay in a contest sponsored by the International Municipal Signal Association. The puppy was presented at an official ceremony in the presence of the Mayor and Fire Commissioner. 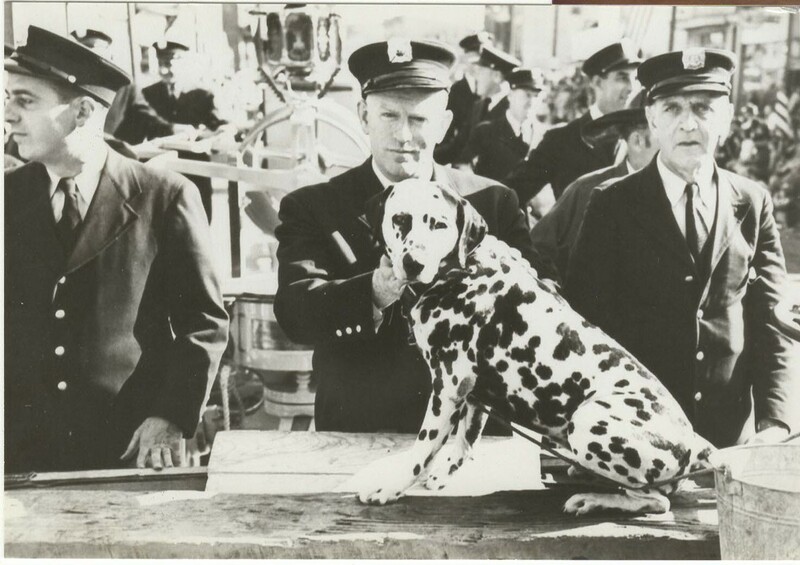 May 1971: The men of Engine 3 adopted another Dalmatian to replace Cindy. 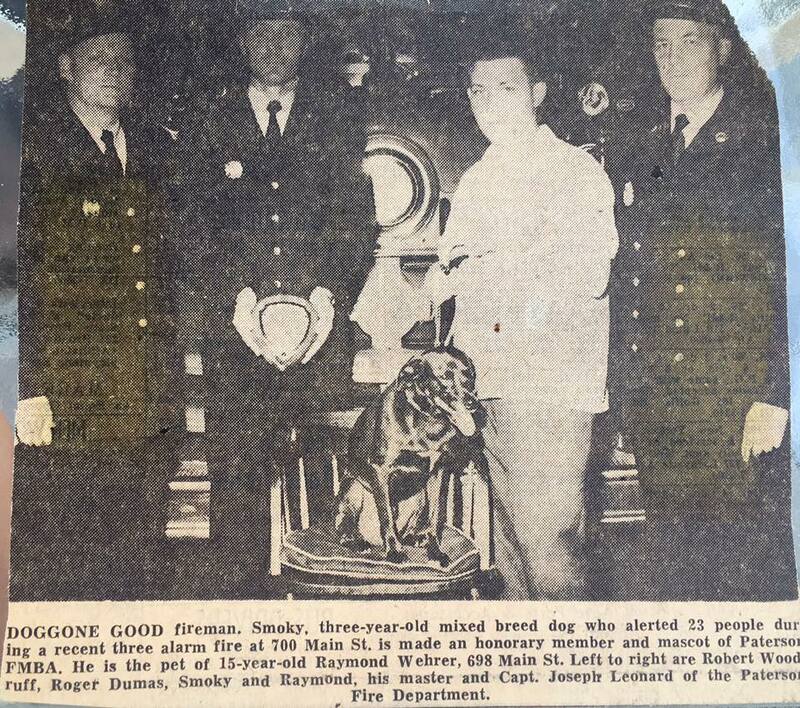 He was named Smokey and was actually rescued from the dog pound by fireman Herbert Donnellan. Northside Temple Street Firehouse: Battalion Chief Michael Fleming, "Smokey" and Company members: ​Tour 4, Battalion 3, Engine 4 and Ladder 2. 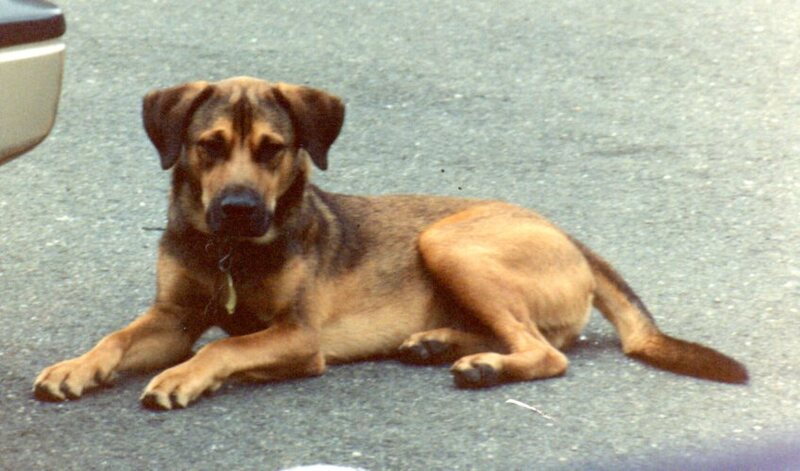 Smokey was adopted from the Newark Humane Society. August 17, 1995 - Incident # 953208 – 347 Belmont Ave. @1322 Hrs. Tour 4 on-duty. Mutual aid to Haledon. L-R: Captain Tony Maldonado, F/F Robert Stemmler. 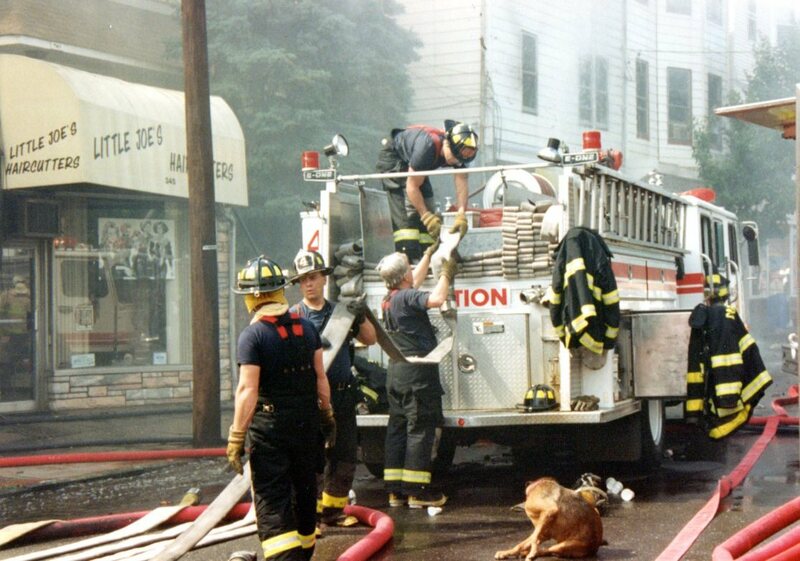 F/F Carlos Pagan, F/F Glenn Calamita, Captain William Henderson, Battalion Chief Mike Fleming, F/F Andrew Ackerman, F/F William Taylor, F/F Rocco Alliotta, Smokey "the dog. " 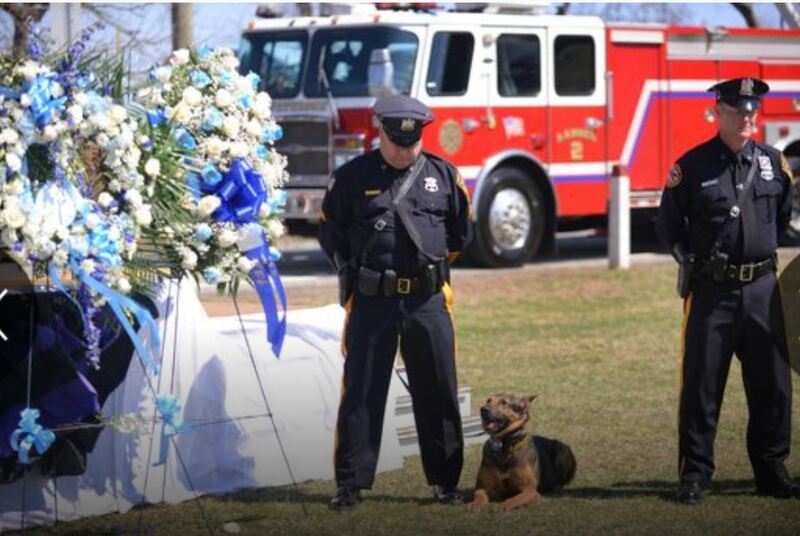 Smokey, works as a fire department mascot and guard dog in Paterson, N.J.; The firefighters at the Northside Firehouse on Temple Street in Paterson call Smokey, a friendly 9-year-old mixed breed who looks mostly like a German shepherd, a ''Paterson street dog.'' But it's a compliment to his street smarts, not a slur on his lineage. Smokey has lived and worked at the firehouse since he was a puppy and two firefighters brought him there from an animal shelter in Newark. Dave Coughlan, a Paterson firefighter who usually watches after Smokey, says the dog doesn't go on as many fire calls as he did when he was younger. ''We watch him a little more carefully now,'' he said. ''We don't want him to get hurt.'' But that hasn't stopped him from working: when he's not on a fire call, he stays behind and guards the firehouse until the firefighters return. 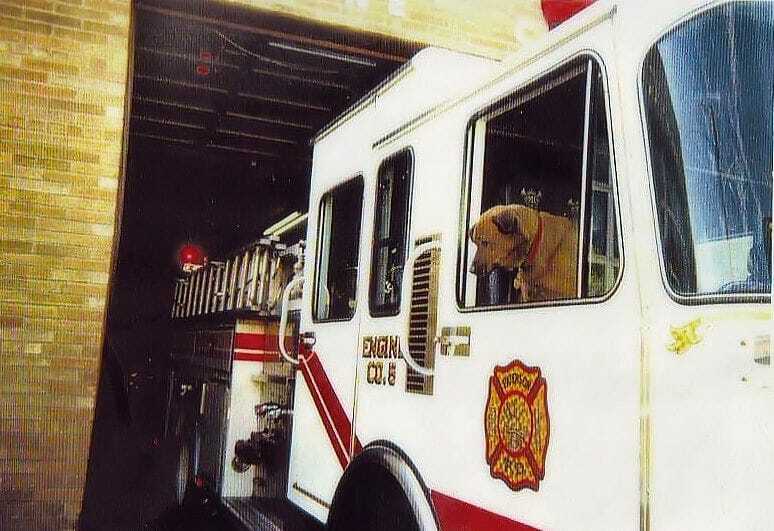 July 20, 2001: Smokey the fire dog responds to its last alarm. 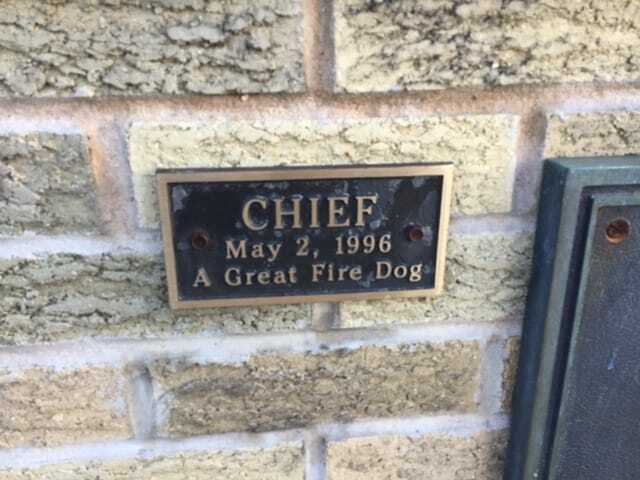 The plaque reads: SMOKEY - A True and Loyal Fire Dog - Date of Appointment October 15, 1991 - Answered Last Alarm July 28th 2001 - Sadly missed by members of Eng Co. 4 - Ladr Co 2 - Batt 3. 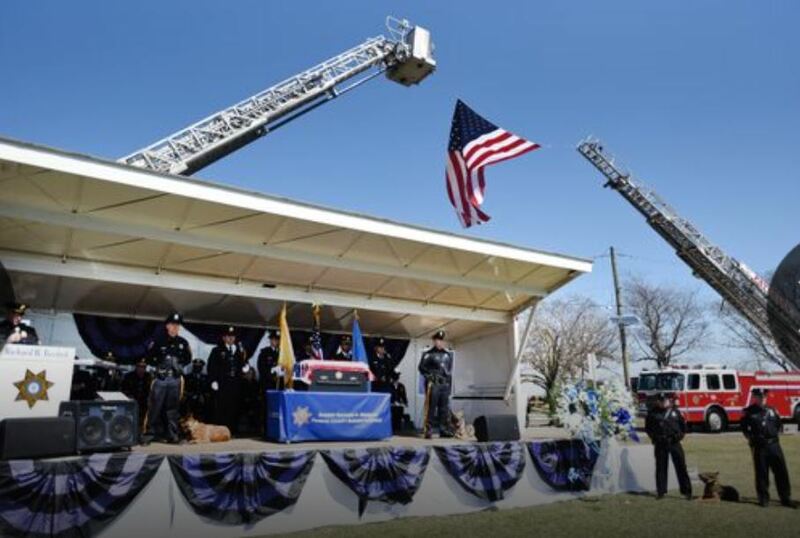 Smokey's ashes are encased within wall of the firehouse. Below is "Nozzle" at Southside Firehouse with BC Robert Meyers (1st Battalion) and men of E6 and R2. 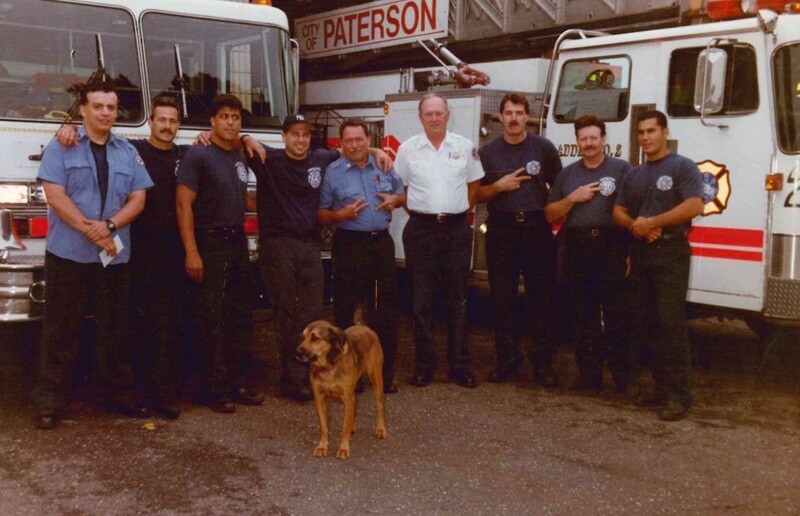 L-R ​B/C Robert Meyers, F/F's Paul DiFalco, Charles Onorato, William Henderson, Captain Bruce Selowentich, F/F's Robert Poloniak and Andrew Ackerman circa post 1991. Nozzle passed in 1993.